First it was hundreds and thousands. Then it was sprinkles. 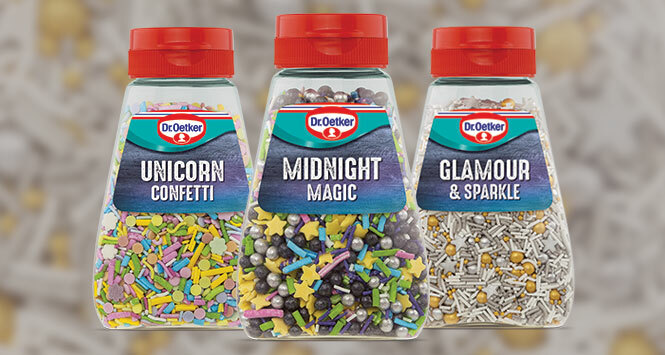 Now home baking brand Dr. Oetker has thrown down the gauntlet to the cake decoration sector with the launch of its Ultimate Sprinkles range. The products have been developed to help bakers “theme” their bakes according to the latest decoration trends (such as metallic or unicorn) and come in a larger jar for coverage of a whole celebration cake. The sprinkles can be added to iced layer cakes and cupcakes, or used as an ice cream topping. Glamour & Sparkle (115g, RSP £2.29) features a variety of gold and silver sprinkles, and is – according to Dr. Oetker – perfect for birthday and anniversary celebration cakes, as well as seasonal occasions. Midnight Magic (110g, RSP £2.29) helps give home bakers a strong themed look through a mix of different-shaped black and coloured sprinkles. So-called “galaxy” baking is apparently a growing trend among bakers looking for dramatic decoration that stands out from the crowd. Unicorn Confetti (110g, RSP £2.29) taps into the current unicorn craze. It offers a rainbow of bright colours, and the large jar can cover a full unicorn-themed layer cake. The Ultimate Sprinkles range is available to independent retailers from April 2018.